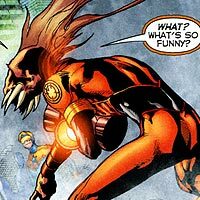 Agent Orange is the leader and usually the sole living member of the Orange Lantern Corps which utilizes the orange light of avarice in an unending attempt to consume all he sees. Concerned that the inhabitants of the planet Earth were growing too powerful as a result of their adaptability, several aggressive alien races banded together to annihilate the threat of the human species. As the rest of the JUSTICE LEAGUE confronted the alien threat directly, Booster Gold is relegated to monitor duty at the New York City branch of the JUSTICE LEAGUE INTERNATIONAL EMBASSIES. The unsuspecting Booster is ambushed by miniaturized Khundians, the only members of the Alien Alliance that Booster will meet face-to-face at the time of the invasion. (Much later, Booster will encounter Dominators while visiting their home world, and the Dominators will ironically consider Booster the leader of a human-led invasion against the Dominator race.) In the global chaos spawned in the wake of the detonation of the Alien Alliance's gene bomb, an unaffected Booster Gold will be one of the few heroes defending the world while a cure is sought for those heroes affected by the bomb. 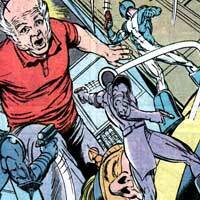 In this capacity, Booster will encounter villains such as Strobe and Two-Face. Much later in his career, Booster will become the prisoner of the Alien Alliance and encounter Vril Dox II (see L.E.G.I.O.N.) and Estrogina aboard the Citadelians' Starlag prison ship. Also called Professor Ivo's Amazing Android in honor of his creator, Amazo is a artificial intelligence capable of replicating the powers of members of the JUSTICE LEAGUE. 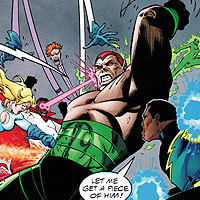 There are several different incarnations of the Amazo android known to exist, though rarely is more than one ever active at a time. Booster Gold joined the Justice League reserves to combat a titanic version of the android in their first meeting. This is the second time that Booster Gold had fought an android built by Professor Ivo, the first being android duplicates of Professor Ivo himself that attacked him during an autograph session with MISTER MIRACLE. Booster Gold has never actually met Professor Ivo.